Home > Decor Photos & Ideas > Crystal Columns, Beaded Curtains & Crystal Ceiling Drapes = Las Vegas Fabulousness! Crystal Columns, Beaded Curtains & Crystal Ceiling Drapes = Las Vegas Fabulousness! There are few places that specialize in over the top dazzling design the way that Las Vegas, Nevada does, and we couldn't help but photograph some of the eye-popping displays of Beaded Curtains, crystal columns, crystal ceiling curtains, and so many more bling intensive design features on a recent trip to the city. 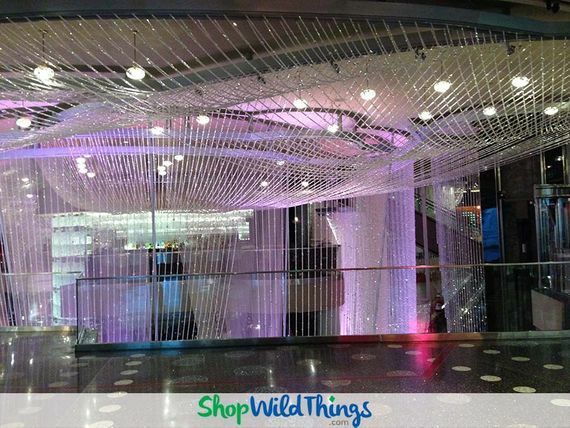 The Cosmopolitan took the prize for sheer bead-to-the-square-foot concentration with what we think is best described as an art installation of beadwork. The centerpiece of the casino lobby holds a bead feature that combines crystal ceiling drapes, Crystal Columns and bead curtains in a stunning display of sparkling fabulousness. 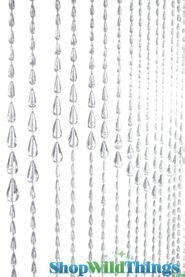 The closeup of one of the curtains shows how bead strands that include larger pendants can create a rich look and texture. 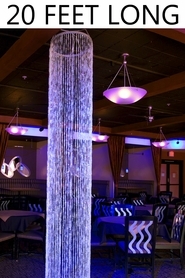 Raindrop Curtains are just one option to create this effect on a budget. Again, the light pink color is an effect produced by lighting ~ these iridescent curtains can be turned any color simply by gelling the lights that strike them. In the last photo, the view of a portion of the installation from the bottom looking up gives a sense of the height, imagination, and vision in this symphony of beads. Crystal columns in combination with custom bead curtains and Crystal Ceiling Curtains really make the sky the limit, in terms of both height and creativity. 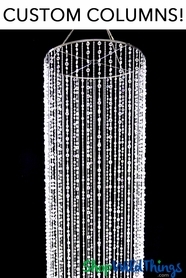 If you love the look of this beaded art installation and want to try it on a smaller scale at your next event ~ or to enlarge it to fill an even bigger space ~ we can help. 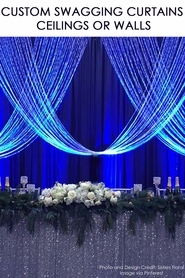 From supplying custom ordered bead curtains, drapes, and columns in any length and almost any style to helping you figure out exactly what you need to get the look you want, our customer service folks are experts. They can reach out and touch our huge array of in-stock products, and they can help you assess how custom orders might fit into your event plan as well. Give us a call at 928-855-6075 and let us help you make your next event as fabulous in real life as it is in your head.